← WiFi Plant Sensor – Wer ist das großzügige Heinzelmännchen? India, the world’s largest democracy is also the 3rd largest Muslim country worldwide. With 177 million Muslims (10.9% of global Muslims) it’s only behind Indonesia (205 million or 12.7%) and neighbouring Pakistan (178 million or 11.0%) and far ahead of Egypt, Iran and Turkey (all numbers from Wikipedia). So far Muslims have been included not at least by the ruling Congress Party of Manmohan Singh and the Gandhi-family. Their politicians included many backgrounds. The Congress party’s old success model was an alliance of high caste and lowest caste groups including Muslims. After the just concluded largest democratic election ever, the hindu-nationalist BJP will take over and elect Narendra Modi as new Prime Minister. This is a double danger for the Inclusion of the 15 percent Muslims in India. First, with the Congress party, also Muslims nearly disappeared from the Lok Sabha, the lower house of India’s national parliament. Only 20 out of 552 members are Muslim. This equals 3.6% of parliamentarians for 14.6% of the population. This alone is a mis-fit, yet not already a danger. BJP itself shows a scary low inclusion itself. Out of 282 members BJP won in the Lok Sabha, none is a Muslim. It’s the first time in 30 years for a single party in India to win an absolute majority in the Lok Sabha. Inclusive politics will not be guaranteed by any sort of coalition. Second, Narendra Modi, the upcomming Prime Minister and unchallenged BJP leader has a bad history himself. He governs the state of Gujarat since 2001. In 2002 a train full of Hindu pilgrims was attacted. In following riots, more than 250 Hindus and nearly 800 Muslims were killed. Police hardly intervened. And years later the Chief Justice of the Supreme court observed in open court he had lost faith in the Gujarat government in this case. When confronted with these accusations he walked out of a TV interview in 2005 with Karan Thapar on CNN-IBN. Third is a counter argument made by Christian Wagner of Stiftung Wissenschaft und Politik in Berlin. Federalism in India and the representation of states in the Raja Sabha, the upper chamber of India’s parliament, will still make it necessary for Modi and his BJP to form compromises with at least some regional parties. This institutional argument is supported by the fact, that 80% Hindus in India do not at all form a coherent political block but are divied by caste and languages and respective regional identities as multifold as Europeans know them. 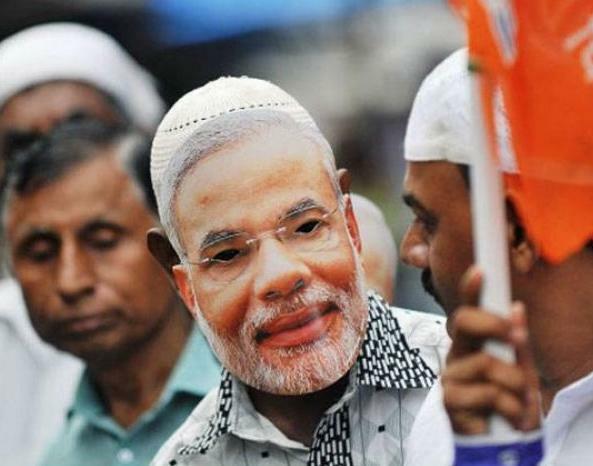 Times of India reports from the campaign trail this sentence of Modi on Muslim voters: “Today it is anachronistic to think that a community won’t be interested in development and good governance. The Indian voter today is more mature than what our political opponents give him credit for.” To me this sounds not overtly encouraging. Yet, to me it also remains unclear who most Muslim voters in India voted for. Since Congress was obviously unable to win much votes. Many Muslims might have done, what my Camel rider in Jaisalmer had told me in 2007: He had voted for the BJP, because they had served the better feast and organized the better party. The next years will show how much Modi can deliver on his promises. And how much the media and AAP might play positive roles in pressing for change to the better. This entry was posted in EN - English, Indien, Politik, Reisen, Religion. Bookmark the permalink.